Review: This story was a nice change of pace for me. It took me to a place a world away without being so descriptive that I lost interest. The names and events were also easy to follow without being too much. As for the actual story, it starts out with poor Aenor who was wrongly imprisoned and made a slave. After being sold a few times, he ends up at the mercy of a Roman tyrant. He’s just a smidge too old to really tickle Nero’s fancy, so Nero uses and abuses him worse than the dog he insists Aenon is. He is raped and brutalized, though most of it is implied and not heavily detailed. It was easy to feel his level of hopelessness. Then there is Novius Senna, who notices Aenon when visiting Nero. Senna has big plans to rid the world of Nero. Unfortunately, he can’t do it alone. But he sees a potential ally in Aenon. He shows Aenon the first taste of kindness he’s felt so far, and the two reach a mutual agreement to kill Nero. They agree to carry out the plan knowing full well they will both most likely perish once it is accomplished. 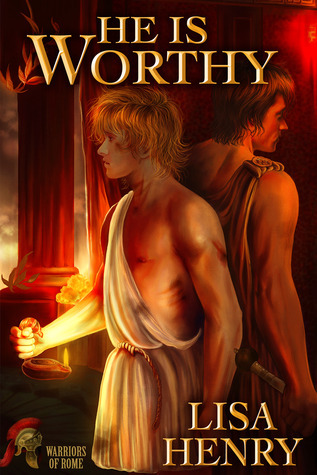 Senna will be rid of his guilt for the jobs he has done for Nero in carrying messages to those who must end their own lives, and Aenon will get revenge on the Romans who have hurt him and taken him from his home. Things do not go to plan, and there are more betrayals and tortures. The end seems near for Aenon, and Senna as well, but the two don’t give up on each other. This is more about the plight of each man and the roles they play in the history of the Roman Empire than it is about their own relationship. They do form a friendship of sorts and their relationship is strongly based upon trust more than anything else. I did miss having more involvement between the two MC’s but it out well enough for this story, as that really wasn’t the focus here. This ends well, but was really more of a HFN. If you’re looking for something a little gritty, a bit historical and overall interesting quick read, give this one a try.